The charity Save the Children has produced a compelling video public service announcement, which brief snippets of a young girl’s life, going from a happy, safe childhood, to living as a refugee amidst war. Interestingly, the child depicted – and the location – is the UK — to bring home how children living ordinary lives in Syria have been thrust into what would before have been a completely unthinkable nightmare. Read more about the video now. This entry was posted in News Coverage of Syria, Syrian Children, Syrian Refugees, Videos and tagged conflict in Syria, humanitarian aid, impact on children, refugees, Save the Children, Syrian children, video on March 12, 2014 by palmyrarelief. 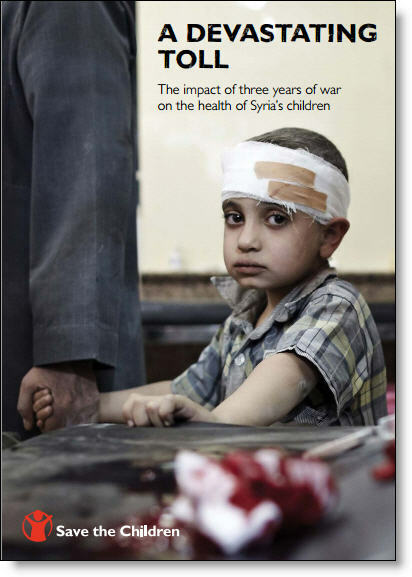 Save the Children has issued a report on the status of health care in Syria, titled “A devastating toll: the impact of three years of war on the health of Syria’s children.” The report exposes a broken health system and its consequences: children not just dying from violent means but from diseases that would previously either have been treatable or prevented. Download a copy of the report now. This entry was posted in Humanitarian Aid to Syria, Medical Care in Syria, News Coverage of Syria, Refugee Crisis - Syria, Syrian Children and tagged conflict in Syria, doctors in Syria, humanitarian aid, impact on children, medical care in Syria, Save the Children, Syrian children, war injuries in syria on March 12, 2014 by palmyrarelief.